Social media is everywhere. With its meteoric rise, it has become increasingly important for businesses to utilize the instantaneous and global reach of social media. From increasing brand recognition to improved customer service, meaningful engagement, retention, transparency and more, social media is a medium that every business, small and large, can use to its benefit. 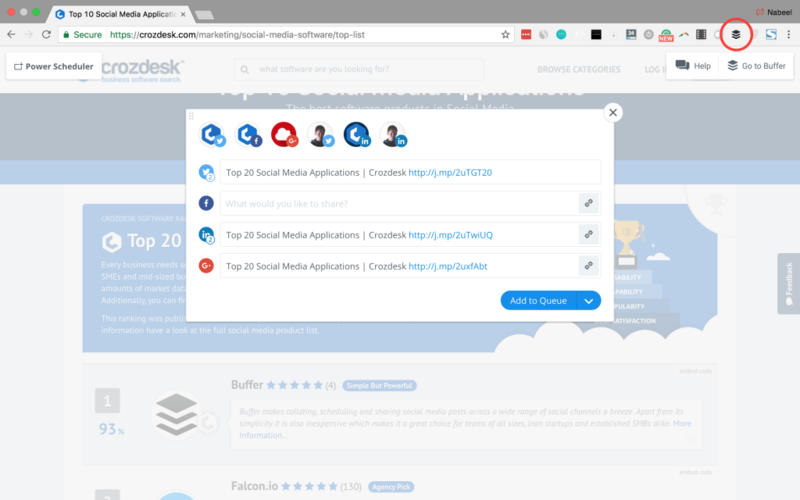 Crozdesk’s Top 20 Social Media Software 2017 list features applications that will make your social media channels and campaigns an absolute breeze to run. As more and more businesses invest their marketing budgets into social media, the vendor landscape is evolving rapidly and Social Media Software Products are getting increasingly sophisticated. The Crozscore is a clever little algorithm, which calculates the overall quality of business cloud software in relation to its competitors. Scheduling tools, advertising campaign management, in-depth analytics, fan management, content creation, and all their other features combine to help businesses monitor, publish and respond. The general user satisfaction, usability, and overall popularity of each product can be measured intelligently by the Crozscore. Utilizing a wide variety of market data, the Crozscore reveals the top software players in social media today. Buffer is #1 in our list, tagged ‘simple but powerful’ by our software reviewer, with a resounding 95% Crozscore rating. It is a social media management application that uses a clean interface, various plugins and extensions to facilitate users as they schedule posts across Facebook, Twitter, LinkedIn, Google Plus, and Pinterest with some support for Instagram. Every page on Buffer abides by its intuitive and simple design philosophy. Buffer utilizes a quick and easy drag-and-drop functionality, which can be extended to Buffer for Business that facilitates a content workflow with review functionalities for teams. This, coupled with the ‘content inbox’, a sleek interface that pulls feeds from selected blogs and publications, enables you to curate relevant content without much trouble for a stress-free content publishing experience. The Buffer Chrome extension simplifies content sharing with the click of a button. Buffer has managed to garner over 4.5 million users around the world. A testament to the success of this simple but powerful application is the 65,000 or more paying customers it has managed to gather over the last six years. Its popularity is the result of many things it does right, but one of its primary draws is its simplicity and ease of use which has made it a favorite. With a Crozscore of 90%, Falcon.IO is #2 on this list and tagged ‘all rounder’ by our software reviewer in part due to its customer management services. Falcon.IO is a platform for social media management, which also has some excellent tools to improve customer experience. Not only that, it also has a slick, user-friendly interface and most of the tools you would typically expect from a publishing CRM. The SMMS also has many features that are suited for medium and large businesses that are looking to enhance their existing customer relations. Creating a campaign is simplified through Falcon.IO’s slick interface. Unlike many other entries on this list that focus on publishing content and managing accounts, Falcon.IO’s deep analytics tools help you find and manage large audiences. For example, through these advanced analytics, it can flag keywords and terms that are used by a specified audience. From there, It can discern a myriad of different demographic variables which can be used for effective content mapping and audience segmentation. Falcon.IO is showing incredible growth, reportedly doubling its US business in 2016. This follows a year of successes for the company, as they won Facebook’s Innovation Spotlight Award in the ‘personalized marketing at scale’ category, boasting of around 950 clients today with 25,000 active users worldwide. Sprout Social is in the Top 3 with 89% on the Crozscore. 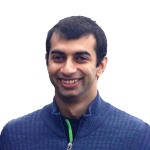 Sprout Social is a social media management and analytics software for businesses. Its features include post scheduling, analytics, publishing, user engagement, customer service support and other tools that help with team collaboration. It contains a high number of incredibly robust and in-depth analytics features and tools like the ‘smart inbox’ which greatly streamline a production team’s content curation efforts. 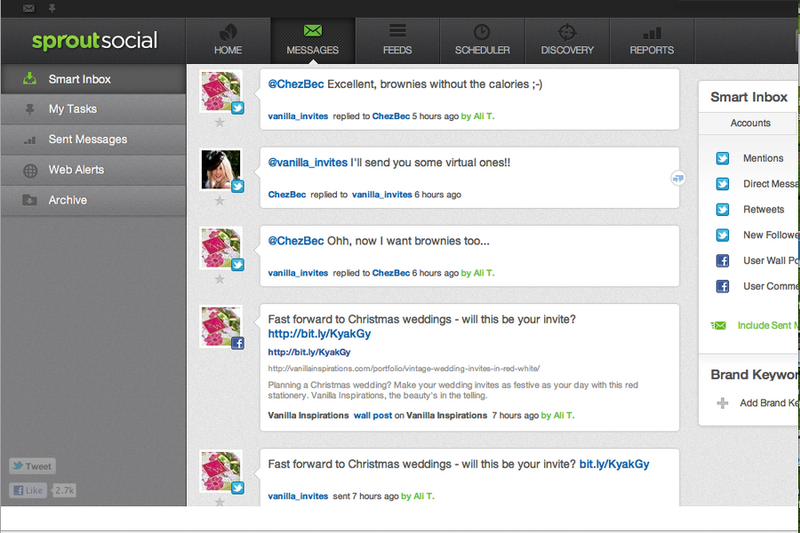 Sprout Social’s ‘smart inbox’ combines messages from different social media channels in one place. Founded in 2010, Sprout Social has a strong user base of more than 17,000 who use the service regularly to form relationships with their respective audiences. Agorapulse swoops in at #4 with a Crozscore of 87%. As a social media management software that bridges communication between businesses and customers across all major channels, it includes analytics, moderation, publishing and competitor analysis functionalities. Agorapulse is an excellent choice for small and medium businesses as it has many features that promote efficiency and organization among teams and co-workers such as, team scheduling, task delegation and team reports. This jack of all trades solution fully integrates with Facebook, Twitter, Google+, Instagram and LinkedIn. User management is simple and straightforward on Agorapulse. It also offers a set of handy features that cut down on repetitive tasks, like auto-moderation for comments, and highlighting comments in need of immediate attention. Founded in France in 2010, Agorapulse has close to 24,000 active users today and is continuing to grow its user base steadily. The #5 spot belongs to Mavsocial, with a Crozscore of 87%. This social media management and advertising software was born in 2012 to provide an easy solution for scheduling and publishing content on a large variety of social media networks, which comes up to 50 now. Some features that set it apart include the ability to track social media interactions and messages, and in-depth strategic planning which utilizes detailed campaign calendars and categorically sorted posts. One of Mavsocial’s most attractive features is the mass storage and categorization of media assets. This is particularly useful for medium and large businesses that have multiple brands to manage. Each specific brand has its own set of pictures, videos and infographics with different access levels, so Mavsocial can serve as a ‘brand warehouse’ since it does a great job of efficiently storing your content. 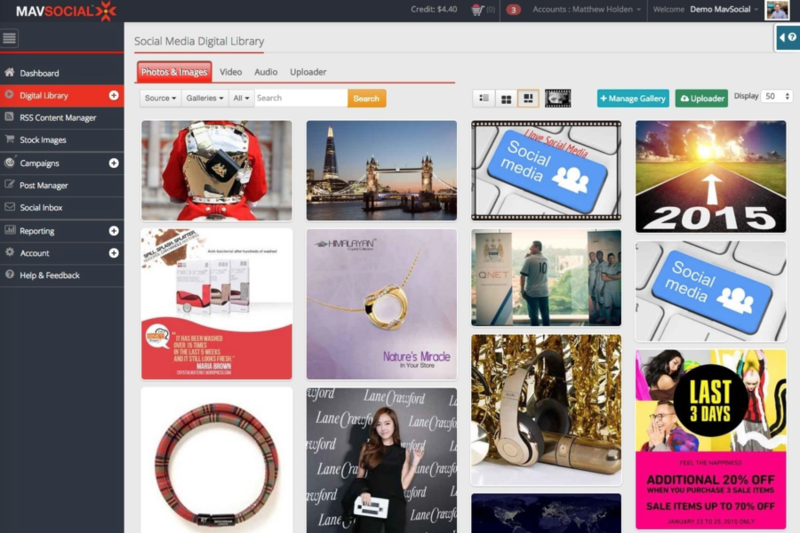 Mavsocial’s digital library can act as a content repository for digital asset management. Moreover, Mavsocial has an extensive library of stock photos that are free for its nearly 3,000 monthly active users. With a score of 87% and a #6 rank, Review Trackers will let you tackle the age-old issue of finding and promptly responding to reviews of your business or product. 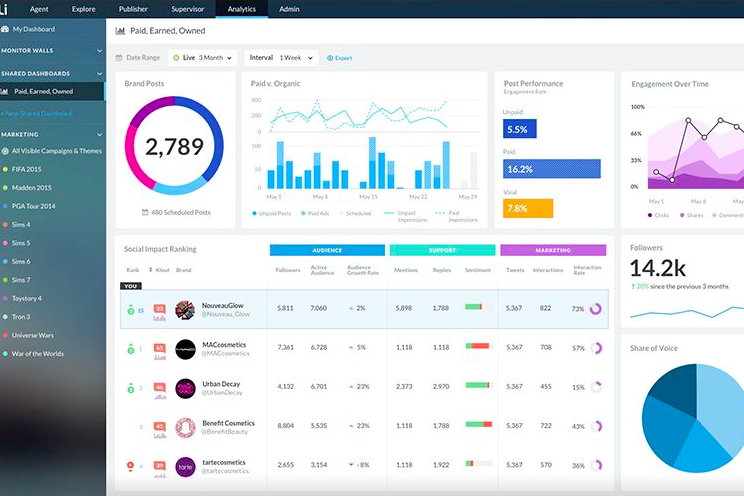 ReviewTrackers is a review management solution that will enable you to track and measure the state of your customer experience by monitoring over 80 review sources including Google, Facebook and TripAdvisor. It can even provide avenues for businesses to foster positive reviews. It is also great for supplementing other CRM systems that you may use. ReviewTrackers has an intuitive interface that lets you respond to reviews with one click, and other tools that let you discern your most happy customers (and reach out to them). It is a no-brainer for customer-facing businesses who have a need for a wealth of comprehensible data to confidently assess their ongoing customer service strategies. The ReviewTrackers mobile user-interface gives the most essential information to users on the go. They measure their ‘users’ based on their locations, of which they have more than 34,000 currently after starting off in 2012. Hootsuite has landed #7 on our list with a Crozscore of 84%. 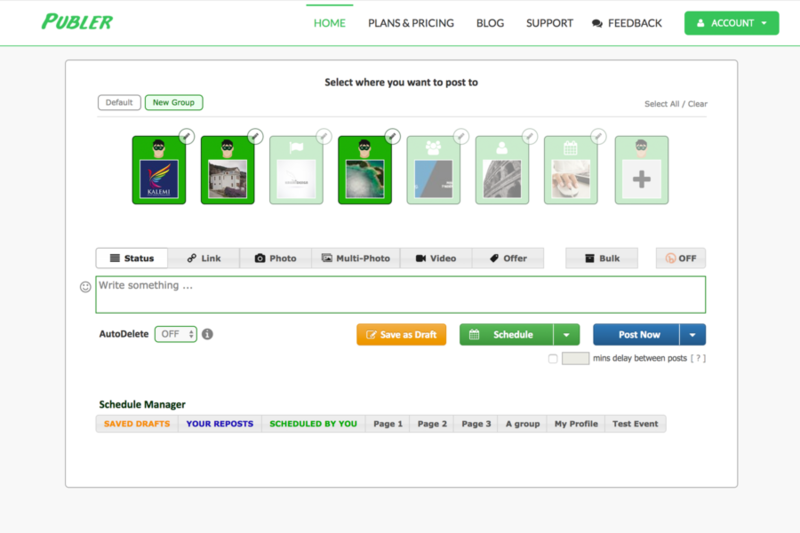 Our software reviewer tagged it ‘team pick’ for its extended collaborative features. 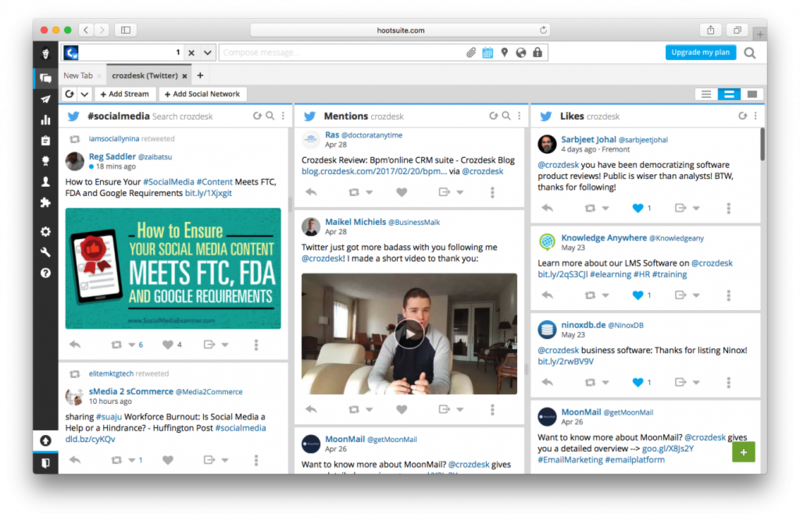 Hootsuite is an SMMS with a liberal integration philosophy that lets you schedule, post and track content on all the popular social media websites, manage workflows and social advertising, all with a stellar interface for analytics and transparent pricing strategy. Overseeing trends, mentions and engagement side-by-side is very simple using the intuitive Hootsuite interface. It is easy to see why so many have relied on this stalwart social media management service. Simply put, its features aplenty, and it is well-suited for both individuals and businesses. It also helps that it features a free service that lets you manage up to 20 different social media accounts. With HootSuite, you can post to more than 35 of the most popular social media websites. Hootsuite’s handy features include an ability to send targeted messages to predefined groups, robust analytics and collaborative teamwork functionalities. It allows multiple administrators on different social media accounts, meaning that the task delegation process is straightforward and easy to visualize even for large enterprises. Even though it is already the market leader by a wide margin, Forrester Wave™ [SMMS, Q2 ‘17] gave Hootsuite a full score for its ‘measurement and data’ offerings, planned enhancements and pricing transparency. HootSuite has been around since 2008, allowing the legacy SMMS to iteratively improve over time and garner an expanded user base. Its success is underscored by its 15 million users. It squeezes into the #8 spot with a Crozscore rating of 84%, and our software reviewer tagged it ‘agency pick’. SocialPilot is a social media marketing tool that aims to increase traffic and brand awareness. Its many features include post scheduling, analytics, team collaboration tools, client management functionalities, and even content suggestion feeds. SocialPilot is a great catch-all service. 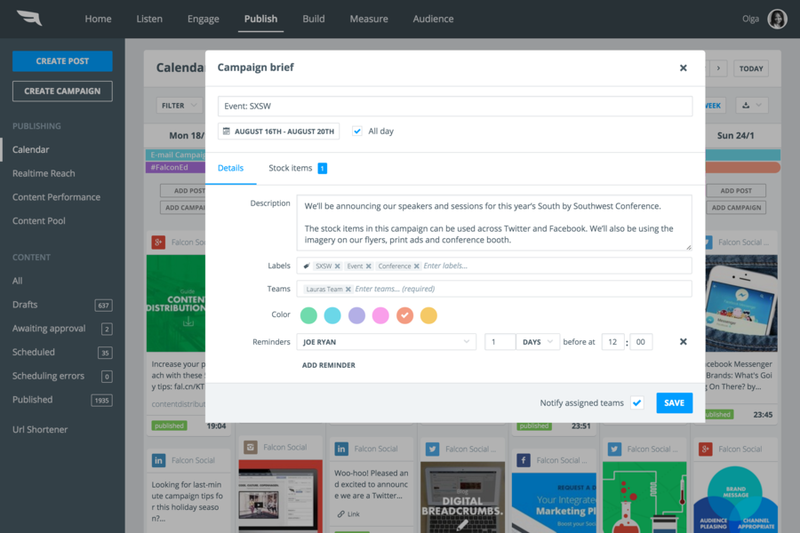 On Social Pilot, you can manage, integrate, and schedule content for all of your social media accounts. It is particularly helpful for agencies with a large client base, as it can connect to 200 social media profiles while queuing 5000 posts in its scheduler. 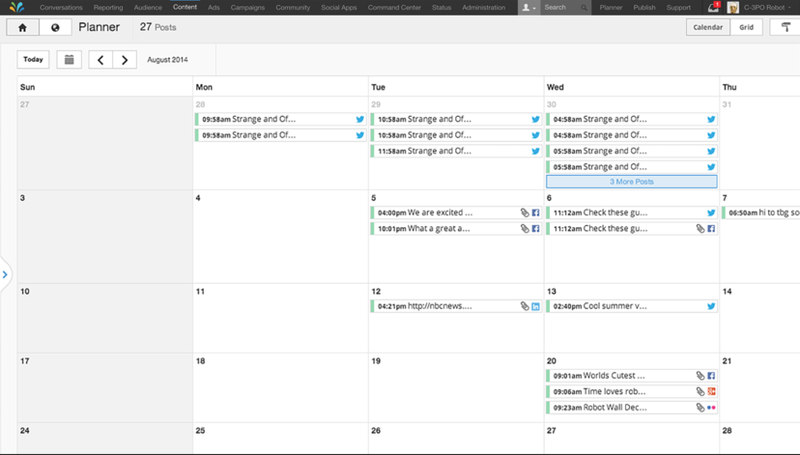 To compliment this, Social Pilot enables you the ability to bulk schedule effectively, with just a few clicks. 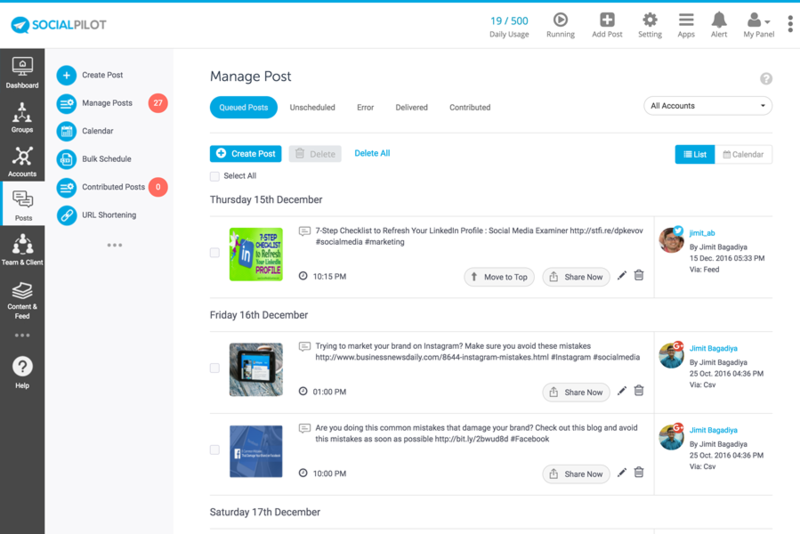 With an elaborate interface to manage social media posts, SocialPilot takes on workflows and bulk scheduling in the same breath. One unique feature that will be appreciated by its users is the ‘branding’ utility. This lets users know when they have received a hand-crafted message as opposed to a ‘posted via-some-schedule-tool’ message that is usually embedded by other scheduling tools. Starting out in 2014 and already having achieved nearly 65000 users, Social Pilot is making its way into the social media marketing scene. The #9 spot belongs to Lithium which has a Crozscore of 84%. This is a social media management tool that excels in managing social customer service. With Lithium, you can schedule and post content including images and videos. The real heart of Lithium lies in its customer service tools that give you the ability to use forums which allows you to generate discussion about your brand, crowdsource ideas that will collate ideas from customers and let them know when they’ve been used, tools which curate customer content, Q&A, blogs, contests and much more. A view of the shared Lithium dashboard that gives a top-level snapshot of paid, earned and owned social impact. All of these features go a long way in enhancing a business’s ability to meaningfully engage with their audiences. To supplement this, they can also increase their efficiency with a vast range of high-end streamlining tools, such as extensive language detection, role-based screens, and a unified social inbox which provides a clear picture of who owns what message and what needs to be actioned. Lithium is a very popular service which boasts of customers in over 34 countries. Its website consistently receives over 100 million monthly visits and has a wide ranging user base servicing over 300 global brands including a number of Fortune 500 companies. Crowdfire is #10 with a Crozscore of 83% and tagged ‘growth hacking pick’ by our software reviewer. The application helps users increase their Twitter and Instagram followers while also providing avenues to gain more followers, such as hashtags or even followers of a competitor’s Twitter handles. It is noted for its unique, ‘clean-engage-grow’ philosophy which effectively stands for keeping spammy and inactive accounts at arm’s length while gaining the right users who will actually be advantageous for growth. 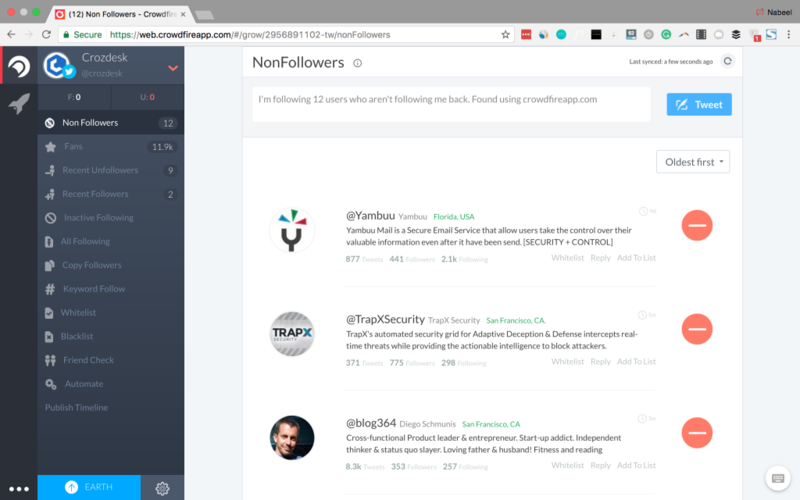 Tracking people who don’t follow back is a piece of cake with Crowdfire, allowing users to focus their energies on audiences that do interact, instead. Crowdfire does this through AI robots which analyze the commercial market daily and suggest audiences and content for you to target and publish. This daily process ensures users are always staying on top of trends, keeping them relevant while encouraging follower growth and ensuring greater interaction with users. Over 15 million people use Crowdfire for its clever features and philosophy that resonates with customers. It has been consistently gaining users since its founding in 2010. It’s dedicated user base has cemented this application as a stalwart among Twitter and Instagram users. At #11, we have Sprinklr with a Crozscore of 83%. It is a catch-all social media management platform that is aimed at large organizations. Tackling nearly every conceivable function of social media management, Sprinklr has too many features and functionalities to name, but it most notably covers audience management, in-depth social media analytics, and content management. The in-built planner makes it easy to track the posts that are already scheduled to go out. 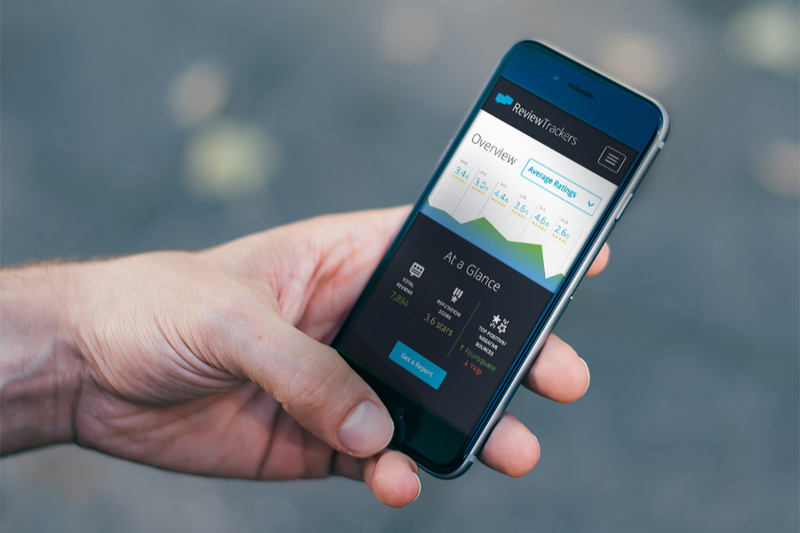 The powerhouse platform can also integrate with systems such as Salesforce and Adobe Analytics and is particularly useful for customer-facing teams. Forrester Wave™ (SMMS, Q2 ‘17) gave Sprinklr a full score for its ‘social advertising’ and ‘measurement and data’ offerings, saying its advertising capabilities extended its social marketing reach. Having been around since 2009 Sprinklr is a stalwart in the industry with almost 120,000 users, globally. Its service boasts a catalog of more than 1200 global companies as their customers, including Microsoft, Verizon, Nike, Macy’s and JPMorgan Chase, just to name just a few. At #12 is Klout which has a Crozscore of 83%. This application will effectively let you measure your social media influence. It uses social media analytics to assess and rank a brand’s overall ‘Klout Score’. This numeric value, between 1-100, ranks social media profiles based on a number of key social media metrics which effectively gauge the impact of your social media channels. The measurements it uses include the usual metrics such as number of retweets, likes, shares, and comments as well as several other data sources gathered from around the web. This enables users to see the effect a social media strategy has using quantifiable and readable data to see the bigger picture. 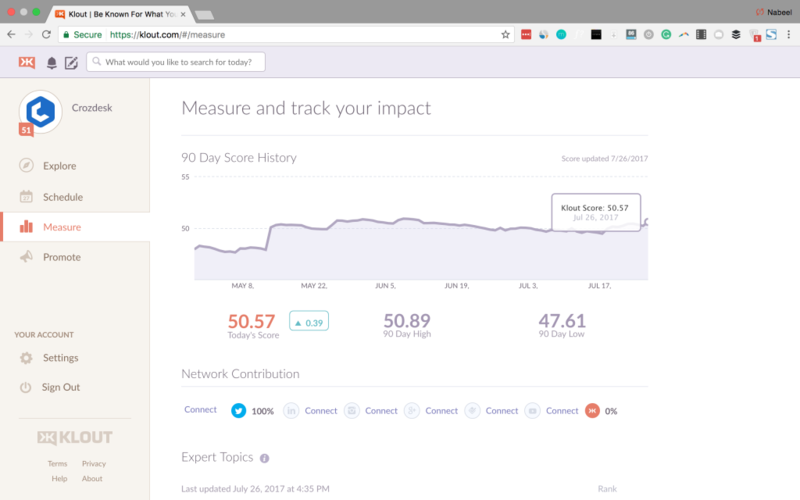 Klout makes it simple to measure and track the impact of your content online. 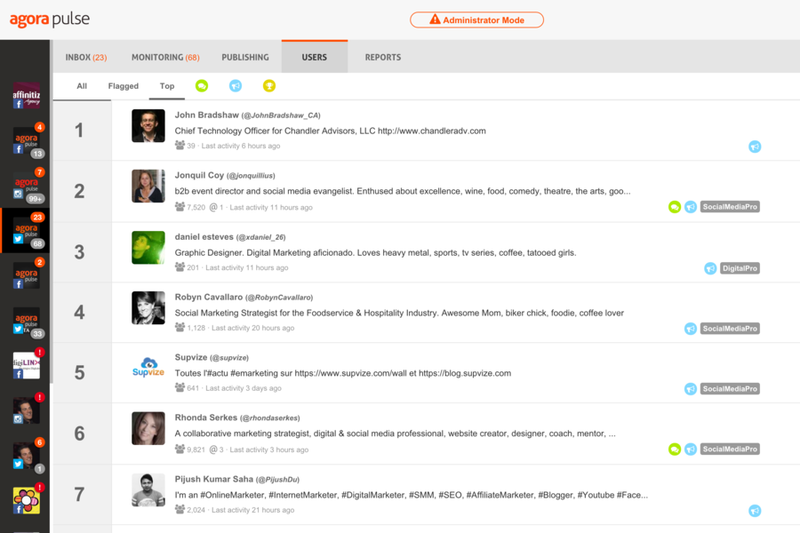 Aside from the ranking functionalities, Klout also provides some social CRM tools such as scheduling and publishing content. Klout is very popular and has gained a user base of over 200,000 businesses since 2008. It can also boast of having over 600 million scored users that use the service regularly. Coming in at #13 is PromoRepublic with a Crozscore of 77%. Known to prioritize the creation of ‘perfect’ content, it has become increasingly popular with freelancers for its wide-range of features that aide single-handed content production. PromoRepublic is notable for its many social media management features such as scheduling, analytics and publishing. It also streamlines content production by keeping users abreast of the trending topics as per their niche. Known to prioritize the creation of ‘perfect’ content, it has become increasingly popular with freelancers for its wide-range of features that aide single-handed content production. This includes an incredibly robust ‘calendar of content’ that contains over 6000 content ideas that all come with visual templates that can be customized easily. PromoRepublic is a relatively new force in social media marketing having been founded in Ukraine in 2014. Since then, its user base has shown healthy signs of growth, this is underscored by the substantial funding it received in 2016 to enter the US markets. With a Crozscore of 76% and a ranking #14, we have Onlywire. This content syndication social media software enhances brand exposure by making their content viral. It does this by automatically submitting content to top social media channels on Facebook, Twitter, LinkedIn and even social bookmarking sites like StumbleUpon. This is accomplished through one-click functionality while giving full control over branded content including publishing preferences. In addition, it features robust analytics and social monitoring to measure the impact of distributed content. At #15 we have Click to Tweet with a Crozscore of 76%. This is primarily a tool used to increase the shareability and exposure of tweets. This quick, easy and free service lets users attach a handy ‘Click to Tweet’ box to any piece of published content. When visitors click on this box, a tweet is composed automatically that can be published with one click. This substantially shortens the amount of work website visitors have to do to quote their content on Twitter while ensuring they bring traffic back to the website or blog. Additional features such as ‘user suggestions’, analytics and click-mapping are also very handy. Click to Tweet has nearly 180,000 active users, but there are many more that have not registered because the basic version does not require a login. Coming in at #16 with a Croscore of 75% is Keyhole. At its core, Keyhole is an in-depth hashtag tracker, that tracks hashtags on Facebook, Twitter and Instagram. Through its visually appealing dashboard, you can gain a wealth of valuable information, including, the reach of the hashtag, related hashtags, the most important users of the hashtag and much more. Keyhole also offers account tracking which monitors the posts and actions taken by accounts of your choosing, and historical data which lets you track the origins of any hashtag or keyword, letting you review journey it undertook over time. At number #17 we have Brand24, which was founded in 2014. This social media listening tool has earned its Crozscore rating of 70% with its powerful listening and analytic tools. With Brand24, it is easy to find out what people are saying about a specific business on the internet, in real-time. It is able to gather data within minutes of posting new content and enables users to act instantly while responding intelligently to feedback, helping foster strong and healthy relationships with their audience. Brand24’s dashboard gives users full control over what they want to see using smart filters for data and sentiment analysis. Swooping in to save you from repetitive tasks is Publer, which takes the #18 spot with a Crozscore of 68%. Whether the content is in video, photo, or text format, Publer lets users schedule a post to almost every Facebook channel, event or group, closed or public. In addition, it provides other CRM tools such as auto-scheduling and bulk scheduling. Publer’s uniqueness is in the fact that it allows users to also publish to Facebook Events and Groups. The uniqueness of this superhero-themed Facebook scheduler is aptly summed by the adage plastered on its website “Schedule everything… everywhere”. Publer was founded in 2015, but despite its infancy, it can boast of over 13,000 users. Narrow comes on this list at #19 with a Crozscore of 65%. This Twitter marketing software helps build a targeted Twitter audience. It achieves this by analyzing keywords and hashtags that are key to a business or brand. Narrow also ‘likes’ relevant tweets and ‘follows’ people based on its analysis. Having launched in 2016, Narrow is a new force in the social media management space. But the tools it offers are new (now that TwitFox is gone) and continuously improving. In fact, it recently underwent a redesign of its UI and dashboard which was well-received by users. At #20, the final entry on our list is TweetDeleter with a Crozscore of 65%. This tool does what it says on the tin. It enables users to efficiently and quickly delete tweets. Whether you’re a company that underwent a massive brand redesign, or a teenager suffering from heart-break, with TweetDeleter all it takes are a few clicks, and past tweets can simply disappear – even if they are more than eight years old. This service complements Twitter’s interface which makes it virtually impossible to find old tweets or delete a bulk of them. Additional functions that make TweetDeleter a complete experience include features that allow automatic deletion of tweets based on preset characteristics. Users can also browse through the entirety of their Twitter handle’s database using the interface enabling them to find tweets based on specified keywords or dates. It even features a function that can delete every single tweet ever posted. With over one million users all over the world that have deleted over 450 million tweets, TweetDeleter has certainly carved out its niche. Stay tuned for our upcoming Customer Relationship Management Software Ranking 2017!